Vicky Husband is a passionate defender of British Columbia’s natural heritage, especially the coastal rainforest and its inhabitants. Through her volunteer effort over the past 20 years, she has become for many the outspoken voice of environmental reason — speaking straight to the point with courage and determination, fueled both the science and by personal knowledge of the salmon, trees, bears, people and places of our province. In the decade-long campaigns to protect Gwaii Haanas/South Moresby, the Khutzeymateen Grizzly Bear Sanctuary, the Carmanah Valley and Clayoquot Sound. 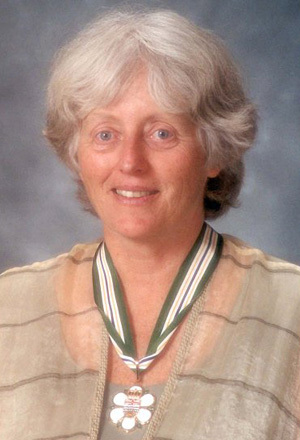 Vicky has worked along side of others, and irreplaceable source of inspiration and support for her colleagues, a tireless champion for biodiversity and natural places in the halls of government, school gymnasiums and the daily news. She can also go it alone if need be, and the Tahsish, Kwois and Silburn, the Nasparti, the Power and the Battle watersheds on the northwest coast of Vancouver Island are protected today largely because Vicky Husband made them her personal campaigns. She blends equal measures of respect for scientific knowledge and the understanding of First Nations, and pioneered the use of satellite imagery for helping others see for themselves how much ancient rainforest has been logged and how little remains. Vicky Husband is a leader in this generation’s commitment and responsibility to ensure a natural legacy for those to come.